The Body Shop Refresh & Reset – Getaway for the New Year! Sweepstakes – Win a trip to Playa Viva! Win a trip to Playa Viva & more! ENTER SWEEPSTAKES HERE – The Body Shop Sweepstakes page. To enter, you will be signing up for a FREE membership to The Love Your Body Club. ENTRY LIMIT – Limit of one (1) Sweepstakes Entry per person, per email address. ELIGIBILITY – The Promotion is open only to legal residents of the 48 contiguous United States and the District of Columbia, who are at least 18 (except Alabama and Nebraska 19 and Mississippi 21) years of age or older as of date of entry. SWEEPSTAKES ENTRY PERIOD – The Refresh & Reset – Getaway for the New Year! (the “Promotion”) begins at 9:00:00 AM Eastern Time (“ET”) on January 18, 2019 and ends at 9:00:00 AM ET on February 15, 2019. The ARV each Sweepstakes Runner Up Prize is $211. The ARV each of all Promotion Prizes is $3,650. WINNER’S LIST – To receive the list of winners of prizes, send a #10 self-addressed, stamped envelope for receipt by February 15, 2019 to: Refresh & Reset – Getaway for the New Year! Winners List Request, c/o Realtime Media, 200 Four Falls Corporate Center, Suite 100, Conshohocken, PA 19428. Spa Week Exotic Escape To Mystical Mayakoba Giveaway Sweepstakes – Win a stay in Mexico! Win a stay in Mayakoba, Mexico (travel not included)! ENTER SWEEPSTAKES HERE – Spa Week Sweepstakes page. ENTRY LIMIT – Only one (1) entry per person is permitted for this prize. ELIGIBILITY – To enter the Giveaway, You must be a resident of the fifty (50) United States, the District of Columbia (Washington D.C.) or Canada (excluding the province of Quebec). You must also be twenty-one (21) years of age or older at the time of entry. SWEEPSTAKES ENTRY PERIOD – The Giveaway shall begin at 11:30AM (EST) on March 19, 2018 and end at 11:59pm (EST) on April 30, 2018. 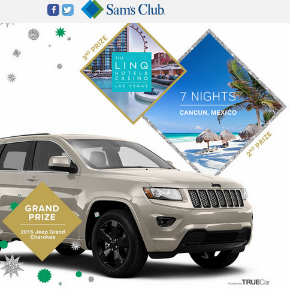 Sam’s Club Holiday Getaway Sweepstakes – Win a Jeep Grand Cherokee! Win a 2015 Jeep Grand Cherokee! ENTER SWEEPSTAKES HERE – Sam’s Club Sweepstakes page. ENTRY LIMIT – Limit to one (1) entry per person throughout the Promotion Period, regardless of method of entry. ELIGIBILITY – The Promotion is open only to legal residents of the 50 United States and the District of Columbia, who are at least 18* (except Alabama and Nebraska 19 and 21 in Mississippi) years of age or older as of date of entry. SWEEPSTAKES ENTRY PERIOD – Sam’s Club Holiday Getaway Sweepstakes begins at 12:00:00 PM Eastern Time (“ET”) on November 2, 2015 and ends at 11:59:59 PM ET on December 11, 2015. One (1) 2015 Jeep Grand Cherokee Altitude 4X4. 17 city/25 hwy EPA est. MPG, 3.6-Liter Pentastar V6 Engine, 8-Speed Paddle-Shift Automatic Transmission and 6,200 lb Towing Capacity – Maximum. Potential winner must work with TRUECar, Inc. to select color and features of vehicle within the ARV amount. Potential winner must work with TRUECar, Inc. and is responsible for any additional fees such as tax, title, and fees on the vehicle. No cash equivalent will be awarded instead of vehicle. If potential winner declines this prize for any reason, an alternate potential winner may be selected by the Sponsor. Orbitz Ski In, Beach Out Sweepstakes & IWG – Win a trip to Aspen, Colorado! Win a trip to Aspen, Colorado! ENTER SWEEPSTAKES HERE – Orbitz Sweepstakes page. 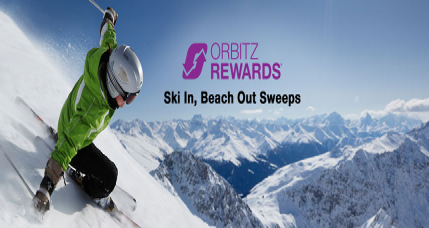 ELIGIBILITY – Orbitz Ski In, Beach Out Sweepstakes is open only to legal residents of the fifty (50) United States (including District of Columbia) who are at least eighteen (18) years old at the time of entry. SWEEPSTAKES PERIOD – The Promotion begins on January 12, 2015 at 12:00 a.m. Eastern Time (“ET”) and ends on February 6, 2015 at 11:59 p.m. ET. PRIZES – Sweepstakes Prize: ONE (1) GRAND PRIZE: A trip for two (2) to Aspen, CO. Trip package includes round trip, coach-class air transportation for two (2) from a major airport near winner’s home (determined by Sponsor in its sole discretion) to Aspen, CO (awarded as a gift voucher); four (4) nights’ accommodations at the Limelight Hotel (single room, double occupancy) (awarded as a certificate); complimentary breakfast daily at the hotel; Aspen Snowmass ski lift tickets for three (3) days (awarded as a gift certificate);. Winner must complete the trip within one (1) year from the drawing date or prize will be forfeited. Trip must be completed by December 15, 2015 or prize will be forfeited. Approximate Retail Value (“ARV”): $4,487. Actual value may vary based on airfare fluctuations and distance between departure and destination. Winner will not receive difference between actual and approximate retail value. ONE (1) FIRST PRIZE: A trip for two (2) to Cabo San Lucas, Mexico. Trip package includes round trip, coach-class air transportation for two (2) from a major airport near winner’s home (determined by Sponsor in its sole discretion) to Cabo San Lucas, Mexico (awarded as a gift voucher); and four (4) nights’ accommodations at the Grand Solmar Land’s End Resort & Spa (single room, double occupancy) (awarded as a certificate). Winner must complete the trip by December 23, 2015 or prize will be forfeited. ARV: $2,960. Actual value may vary based on airfare fluctuations and distance between departure and destination. Instant Win Game Prizes: TWENTY SIX (26) SECOND PRIZES (one (1) prize awarded per day): $100 Orbucks. ARV: $100. 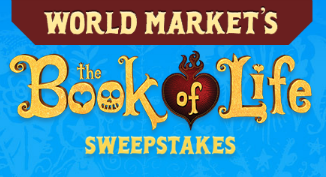 World Market’s Book of Life Sweepstakes – Win a trip to Mexico & more! 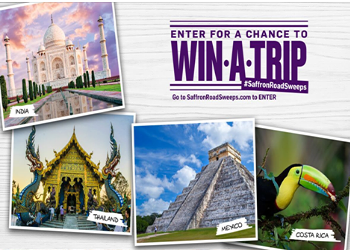 Win a trip to Mexico, a $1,000 World Market gift card & more! ENTRY LIMIT – There is a maximum limit of one (1) Promotion Entry per person per day using only one (1) email address throughout the Promotion Period. ELIGIBILITY – The Sweepstakes is open to legal residents of the 50 United States and the District of Columbia, who are 21 years of age or older at the time of entry. SWEEPSTAKES PERIOD – Sweepstakes begins at 6:00 p.m. Eastern Time (“ET”) on 9/19/14 and ends at 11:59 p.m. ET 10/24/14. PRIZES – One (1) Grand Prize Package as defined below. Package consists of a trip for two (2) to Riviera Maya, Mexico, which includes: one (1) room at the Grand Velas Riviera Maya for six (6) days and five (5) nights; roundtrip coach-class air travel for two (2) from major airport nearest winner’s residence to Riviera Maya, Mexico; taxi stipend of $300.00; a Swim with Dolphins (does not include photo package); and a tour of the Mayan Ruins (Chichen Itza); two (2) movie tickets per week for fifty-two (52) weeks; $1,000 World Market Gift Card; and The Book of Life merchandise. Approximate Retail Value (“ARV”) of Grand Prize: $8,750. Three (3) Runner Up Prize Packages: Package consists one (1) $500 World Market Gift Card. ARV of each Runner Up Prize: $500. SmartSource Summer Blast-Off Sweepstakes – Win a trip to Cancun! Win a trip for 4 to Cancun, Mexico (2 winners)! ENTER SWEEPSTAKES HERE – SmartSource Sweepstakes page. ENTRY LIMIT – Limit one (1) Entry per person or email address per day per Entry method. SWEEPSTAKES PERIOD – Enter between 12:01 AM Eastern Daylight Savings Time (“EDT”) on 5/11/14 and 11:59:59 PM EDT on 7/7/14. PRIZES – TWO (2) GRAND PRIZES: Each Grand Prize is a trip for Grand Prize Winner and up to three (3) Guests. Each Grand Prize consists of round trip economy class air transportation for four (4) persons from the major commercial airport with regularly scheduled flights nearest winner’s permanent residence at the time of entry to Cancun, Mexico, four (4) nights hotel accommodations (one quad occupancy hotel room and tax only) at the Azul Fives Hotel by Karisma and round trip ground transfers between Cancun airport and Azul Fives Hotel. The approximate retail value (“ARV”) of each Grand Prize up to: $5,000. Coupons.com Valentine’s Day Sweepstakes – Win 2 Delta.com gift codes & more! Win two Delta.com gift codes and a $500 American Express digital gift card! ENTER SWEEPSTAKES HERE – Coupons.com sweepstakes page. ENTRY LIMIT – You may enter one time per day during the Promotion Period. ELIGIBILITY – Valentine’s Day Sweepstakes is open only to legal residents of the fifty (50) United States and the District of Columbia who are at least eighteen (18) years old at the time of entry. SWEEPSTAKES PERIOD – The Valentine’s Day Sweepstakes starts Saturday, February 1, 2014 12:00 a.m. PT and will run through February 14, 2014 11:59 p.m. PT. PRIZES – FOURTEEN (14) DAILY ENTRY PERIOD PRIZES – (one (1) Prize awarded during each Daily Entry Period): $50 digital gift card. Approximate Retail Value: $50. ONE (1) GRAND PRIZE – (one (1) Prize awarded at the end of the Promotion Period): Two Delta.com gift codes, sponsored by Orbitz, for a round-trip flight for two to the Caribbean, Mexico or within the fifty (50) United States and a $500 American Express digital gift card. Approximate Retail Value: $2,500.